Are you a product or service professional or division executive facing challenges of managing and maintaining your install base of assets, as well as improving performance and utilization? Existing technology solutions are costly, cumbersome to deploy and don’t provide real time performance insights. 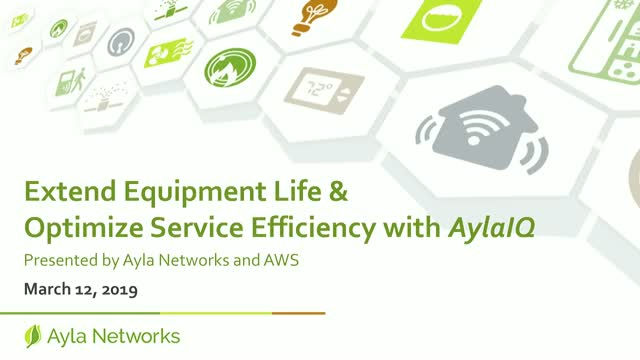 Ayla Networks and Amazon Web Services (AWS) join together to discuss how AylaIQ, a new and incredibly simple diagnostic plug-in solution supported on AWS cloud services, works in transforming asset management. Ayla's partner Vectorform, and customer SharkNinja, will discuss how to view the impact of IoT on your business. As part of the presentation, we will share details on how SharkNinja launched a massively successful robot vacuum in under six months.